Skipping meals will not help you gain weight. Forget breakfast, and you continue the six- to nine-hour fast that occurred while you slept. Take advantage of the morning meal to add extra calories so you can put on pounds to achieve a healthy weight. Increased serving sizes help you gain weight, but sneaky additions of calorie-dense foods also contribute healthy calories. To gain weight, you must eat a surplus of calories. Determine your daily calorie burn rate by using an online calculator or consulting a dietitian. Then, add 250 to 500 calories to that number to target the number of calories you need per day to gain between 1/2 and 1 pound per week. You can eat the bulk of these additional calories at breakfast. Getting more of just any calories, though, isn't the best approach. Muffins, sweetened cereal, pancakes and danishes are high in refined flours; sausage and bacon have lots of saturated fat and additives; artificial fruit punch, syrups and jam offer little nutrition but lots of added sugar. Even if you're underweight, you're still susceptible to the perils of a diet rich in added sugar, which includes the risk of heart disease, stroke and cancer. Instead, choose high-calorie breakfast foods that offer plenty of nutrition. Whole grains, healthy unsaturated fats, fresh fruits, dairy and quality protein should be the emphasis of weight-gain breakfasts. Eggs are an obvious high-protein breakfast choice and, in moderation, are a quality protein choice. Each large egg contains about 80 calories and 6 grams of protein. Don't toss the yolk, either. It's the primary source of calories in the egg, and it's now known that its cholesterol doesn't increase your body's cholesterol levels, writes the Cleveland Clinic in 2015. Add more nutrients to the eggs by cooking them with chopped peppers, onions, tomatoes, spinach and mushrooms. These vegetables don't add a considerable amount of calories, so add an ounce of cheddar cheese, which contains 114 calories and another 7 grams of protein. Consuming lots of processed meats, such as bacon, ham and sausage, increases your risk of developing cardiovascular disease and cancer, reported a study published in "Public Health Nutrition" in July 2015. If you like meat with breakfast, mix raw, lean, ground turkey with salt, pepper, paprika, dried oregano and fennel seeds. Saute as patties in hot olive oil until cooked through. A 4-ounce cooked patty contains 166 calories. Choose whole grains over refined grains. Whole grains contain fiber and naturally occurring, not added, vitamins and minerals. Oats, shredded wheat and oat bran are all cereal options. Cook hot cereal with milk, rather than water, to boost the calories. 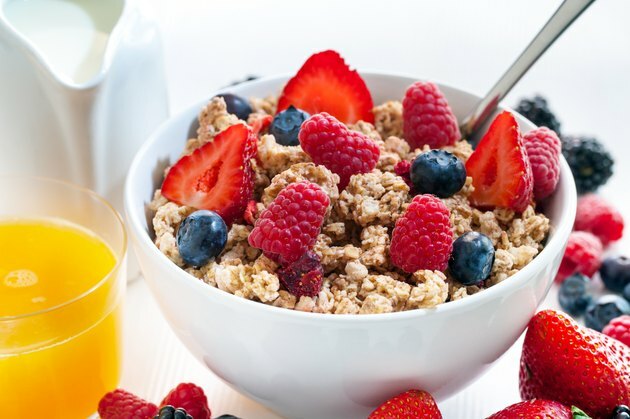 Top the cereal with dry milk powder for an extra 82 calories per 1/3 cup; 1 ounce of walnuts for 183 calories; or 1/2 cup of raisins for 215 calories. Make pancakes with 100 percent whole-wheat flour, and top with nut butter, honey and berries. Choose dense, multigrain breads and bagels, such as pumpernickel or whole-wheat, instead of white variations. In addition to cheese and dry milk, use other dairy products, such as plain yogurt or milk, to boost your breakfast calories. Mix 1/2 cup of granola into a cup of plain yogurt for a side dish with 345 calories. Drink a glass or two of milk after you've finished eating or between meals; 1 cup of 2 percent milk contains 122 calories. Avoid drinking the milk during or before your meal, as it might make you too full to eat all the food. Fruit has about three times the calories of most vegetables per serving. Mix dried fruit into hot or cold cereal. The water has been evaporated, so it's more concentrated in calories than fresh. A cup of sliced banana served over cereal or pancakes, sandwiched with peanut butter or stirred into yogurt provides you with 134 calories. Fruit cups with no added sugar and 100 percent fruit juice offer portable options that boost your calorie intake without a lot of preparation. Avocado -- with 234 calories per cup of sliced avocado flesh -- adds flavor, creaminess and calories to breakfast. Lay slices over scrambled eggs and cheese; blend cubes into a fruit smoothie; or spread mashed avocado over toast. Avocado is a source of healthy unsaturated fats as well as vitamin E, potassium and folate. CNN: Can Eating Fruit Keep Me From Losing Weight?